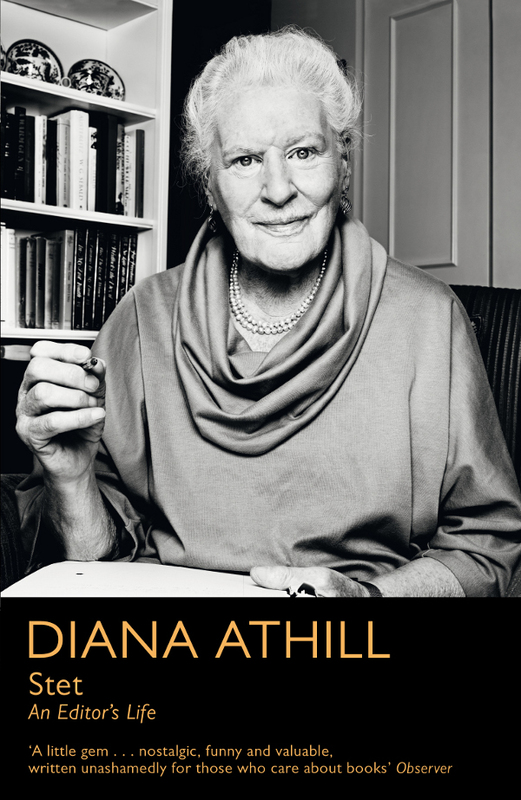 This month’s reading for the Slaves of Golconda group was Diana Athill’s briskly evocative memoir Stet, about her decades-long career in publishing. Other folks have been putting up their smart and detailed posts, and you should hop on over and read them if you haven’t visited already. Partly because I’m tired and busy, and partly because I can’t think of anything substantial to add to their observations, for my contribution I’m just going to quote a passage I particularly enjoyed. It comes almost at the very end, in Athill’s Postscript to the memoir, and it stood out for me because it touches on a number of issues about publishing and taste and literary merit and canonicity that have been coming up a lot in my classes this year — particularly the Somerville Novelists seminar (and as you’ll see, chronologically her remarks are spot on for that one) but also, more recently, in my intro class, where we’ve been talking about feminism and the role of taste-makers and gatekeepers in establishing and policing the literary hierarchy. The ‘crisis in publishing’ and the ‘death of reading’ are also, of course, endlessly reiterated themes in the literary world. I found Athill’s frankness and lack of pretension refreshing, her pragmatism admirable, and her examples thought-provoking. Having seen Andre Deutsch Limited fade out, why am I not sadder than I am? I suppose it is because, although I have often shaken my head over symptoms of change in British publishing such as lower standards of copy-preparation and proof-reading, I cannot feel that they are crucial. It is, of course, true that reading is going the same way as eating, the greatest demand being for the quick and easy, and for the simple, instantly recognizable flavours such as sugar and vinegar, or their mental equivalents; but that is not the terminal tragedy which it sometimes seems to the disgruntled old. It is not, after all, a new development: quick and easy has always been what the majority wants. The difference between my early days in publishing and the present is not that this common desire has come into being, but that it is now catered for more lavishly than it used to be. And that is probably because the grip on our trade of a particular caste has begun to relax. Of that caste I am a member: one of the mostly London-dwelling, university, university-educated, upper-middle-class English people who took over publishing towards the end of the nineteenth century from the booksellers who used to run it. Most of us loved books and genuinely tried to understand the differences between good and bad writing; but I suspect that if we were examined from a god’s-eye viewpoint it would be seen that quite often our ‘good’ was good only according to the notions of the caste. Straining for that god’s-eye view, I sometimes think that not a few of the books I once took pleasure in publishing were pretty futile, and that the same was true of other houses. Two quintessentially ‘caste’ writers, one from the less pretentious end of the scale, the other from its highest reaches, were Angela Thirkell and Virginia Woolf. Thirkell is embarrassing — I always knew that, but would have published her, given the chance, because she was so obviously a seller. And Woolf, whom I revered in my youth, now seems almost more embarrassing because the claims made for her were so high. Not only did she belong to the caste, but she was unable to see beyond its boundaries — and that self-consciously ‘beautiful’ writing, all those adjectives — oh dear! Caste standards — it ought not to need saying — have no right to be considered sacrosanct. Keeping that in mind is a useful specific against melancholy; and even better is the fact that there are plenty of people about who are making a stand against too much quick-and-easy. The speed with which the corners of supermarkets devoted to organic produce are growing into long shelves is remarkable; and there are still publishers — not many, but some — who are more single-mindedly determined to support serious writing than we ever were. She’s right about organic produce (around here, anyway), and though I bet a lot of us would like to have it out with her about Woolf, and maybe also Thirkell, there seems a lot right too in her wry admission that there is no incontrovertible standard, and that it’s all too easy to mystify one’s own preferences. I liked that part too, and fully endorse your comments about Athill. I also had a major quibble with her thoughts on Woolf (Thirkell I’ve never read)! I remember that passage because her comments on Woolf got my bristling! I’ve not read Thirkell before but I have a coworker who loves her and declares she is better than Trollope so I know I will give her a whirl some time. When I read “Stet” a few years back, I not only enjoyed the book, but admired and applauded her postscript. It seems brave for her to admit that preferences of the ruling class could determine British literary tastes (which I happen to enjoy immensely). And I was glad to see that someone else didn’t think Woolf’s fiction was above reproach. This Postscript is typical of Athill’s ability articulate, in writing, an unexpected perspective. It’s why I adore her work. I thought the Woolf comments were indeed provocative — though since reading so much by and about Winifred Holtby (who lost out, obviously, in the Literary Prestige stakes) I’ve had more sympathy for the “too much beautiful writing” argument. I’ve read just one Thirkell novel and really enjoyed it. What I like best is not so much her conclusions as the conversation she’s willing to have. Like Lynette, I think there’s something brave about just ‘fessing up like that about the caste system.